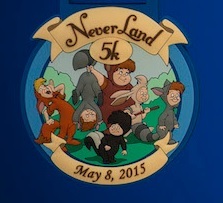 This entry was posted in DisNerd Vacations, General DisNerdom and tagged Exercise, Never Land 5k, Peter Pan, Run Disney, RunDisney, Running, Tinker Bell Half Marathon. Bookmark the permalink. Thank you! I’ll be feeling those cheers as I go, I’m sure! Keep up the progress! It doesn’t happen overnight. Try googling the couch to 5k program. It’s brilliant. You start off small and gradually increase so you’re up to speed by the time you get to the event. I’m not one of those crazy runners. My asthma only allows for so much without having to be transported to the hospital. However! I’ve learned what I can do and I work with it. Cheering you on buddy! You’ve got this! Thank you, Crystal! Here’s hoping I get in the shape I need to be! Craig good for you!!! The RunDisney events are soooo much fun! The 2012 Disneyland half marathon was the main reason why I started to train back in 2011. I can’t say enough how much fun they are! The support staff, the characters, I would have loved to run with you. You still have plenty of time to train. Run / walking is nothing to be ashamed of if need be. Do what you can. You will be surprised how the excitement of race day will energize you and keep you motivated till the end. Good luck!! And look at you now – you run like crazy! Thanks for the well wishes, Terry! You can do eet! I believe in you! Thanks, Cory! I have nothing witty to say in reply! I agree with Crystal- try couch to 5k app, it really does work. This is good to know – I need to look it up! Thanks, Kerry! Good luck with your 5k! My husband and I have just signed up for the Wine and Dine half, and as someone else who hated running, I completely understand your post. We have our first ever 5k in May (so around the same time really) its a local race, but all being well it should be a good stepping stone to having to confidence to do a 10k in the Summer and then complete the Wine and Dine half in November. We have been using a nike+ training plan for our 5k training, but doing a run/walk method like Jeff Galloway advocates. We can now run/walk 5k in 35 minutes which is fantastic, but i’m hoping to get it down to 30mins by actual race time! I’ll keep an eye on your blog and follow your progress! Thank you! I am definitely taking it slow with the walk/run method. I want to definitely be ahead of the sweep time – that’s my goal for my first ever run! Best of wishes on your running quest as well – keep us updated!